Make no mistake. 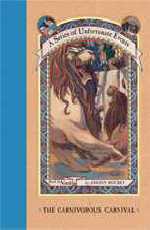 The Bad Beginning begins badly for the three Baudelaire children, and then gets worse. Their misfortunes begin one gray day on Briny Beach when Mr. Poe tells them that their parents perished in a fire that destroyed their whole house. "It is useless for me to describe to you how terrible Violet, Klaus, and even Sunny felt in the time that followed," laments the personable (occasionally pedantic) narrator, who tells the story as if his readers are gathered around an armchair on pillows. But of course what follows is dreadful. The children thought it was bad when the well-meaning Poes bought them grotesque-colored clothing that itched. But when they are ushered to the dilapidated doorstep of the miserable, thin, unshaven, shiny-eyed, money-grubbing Count Olaf, they know that they--and their family fortune--are in real trouble. Still, they could never have anticipated how much trouble. 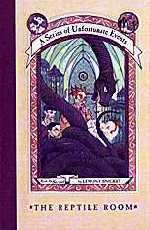 The Reptile Room begins where Lemony Snicket's The Bad Beginning ends... on the road with the three orphaned Baudelaire children as they are whisked away from the evil Count Olaf to face "an unknown fate with some unknown relative." But who is this Dr. Montgomery, their late father's cousin's wife's brother? "Would Dr. Montgomery be a kind person? they wondered. Would he at least be better than Count Olaf? Could he possibly be worse?" He certainly is not worse, and in fact when the Baudelaire children discover that he makes coconut cream cakes, circles the globe looking for snakes to study, and even plans to take them with him on his scientific expedition to Peru, the kids can't believe their luck. 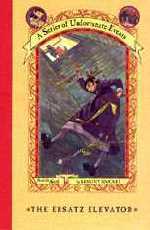 And, if you have read the first book in this Series of Unfortunate Events, you won't believe their luck either. Despite the misadventures that befall these interesting, intelligent, resourceful orphans, you can trust that the engaging narrator will make their story--suspenseful and alarming as it is--a true delight. In The Bad Beginning, things, well, begin badly for the three Baudelaire orphans. And sadly, events only worsen in The Reptile Room. In the third in Lemony Snicket's Series of Unfortunate Events, The Wide Window, there is still no hope on the horizon for these poor children. Their adventures are exciting and memorable, but, as the author points out, "exciting and memorable like being chased by a werewolf through a field of thorny bushes at midnight with nobody around to help you." This story begins when the orphans are being escorted by the well-meaning Mr. Poe to yet another distant relative who has agreed to take them in since their parents were killed in a horrible fire. Aunt Josephine, their new guardian, is their second cousin's sister-in-law, and she is afraid of everything. Her house (perched precariously on a cliff above Lake Lachrymose) is freezing because she is afraid of the radiator exploding, she eats cold cucumber soup because she's afraid of the stove, and she doesn't answer the telephone due to potential electrocution dangers. Her greatest joy in life is grammar, however, and when it comes to the proper use of the English language, she is fearless. But just when she should be the most fearful--when Count Olaf creeps his way back to find the Baudelaire orphans and steal their fortune--she somehow lets her guard down. Once again, it is up to Violet, Klaus, and Sunny to get themselves out of danger. Will they succeed? We haven't the stomach to tell you. "The Baudelaire orphans looked out the grimy window of the train and gazed at the gloomy blackness of the Finite Forest, wondering if their lives would ever get better," begins The Miserable Mill. If you have been introduced to the three Baudelaire orphans in any of Lemony Snicket's previous novels, you know that not only will their lives not get better, they will get much worse. In the fourth installment in the "Series of Unfortunate Events," the sorrowful siblings, having once again narrowly escaped the clutches of the evil Count Olaf, are escorted by the kindly but ineffectual Mr. Poe to their newest "home" at the Lucky Smells Lumbermill. Much to their horror (if not surprise), their dormitory at the mill is crowded and damp, they are forced to work with spinning saw blades, they are fed only one meal a day (not counting the chewing gum they get for lunch), and worst of all, Count Olaf lurks in a dreadful disguise as Shirley the receptionist just down the street. Not even the clever wordplay and ludicrous plot twists could keep this story buoyant--reading about the mean-spirited foreman, the deadly blades, poor Klaus (hypnotized and "reprogrammed"), and the relentless hopelessness of the children's situation only made us feel gloomy. Fans of these wickedly funny, suspenseful adventures won't want to miss out on a single one, but we're hoping the next tales have the delicate balance of delight and disaster we've come to expect from this exciting series. As the three Baudelaire orphans warily approach their new home--Prufrock Preparatory School--they can't help but notice the enormous stone arch bearing the school's motto Memento Mori, or "Remember you will die." This is not a cheerful greeting, and certainly marks an inauspicious beginning to a very bleak story. Of course, this is what we have come to expect from Lemony Snicket's Series of Unfortunate Events, the deliciously morbid set of books that began with The Bad Beginning and only got worse. 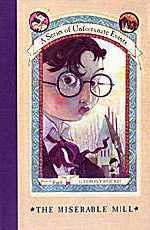 In The Austere Academy, Violet, Klaus, and Sunny are at first optimistic--attending school is a welcome change for the book-loving trio, and the academy is allegedly safe from the dreaded Count Olaf, who is after their fortune. Hope dissipates quickly, however, when they meet Vice Principal Nero, a self-professed genius violinist who sneeringly imitates their every word. More dreadful still, he houses them in the tin Orphans Shack, crawling with toe-biting crabs and dripping with a mysterious tan fungus. A beam of light shines through the despair when the Baudelaires meet the Quagmires, two of three orphaned triplets who are no strangers to disaster and sympathize with their predicament. When Count Olaf appears on the scene disguised as Coach Genghis (covering his monobrow with a turban and his ankle tattoo with expensive running shoes), the Quagmires resolve to come to the aid of their new friends. Sadly, this proves to be a hideous mistake. 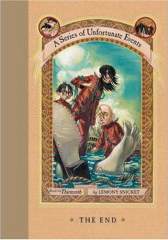 Fans of Lemony Snicket's wonderful Series of Unfortunate Events won't be surprised to find that in the sixth installment the three Baudelaire orphans' new home proves to be something of a mixed bag. As our ever sad but helpful narrator states, "Although 'a mixed bag' sometimes refers to a plastic bag that has been stirred in a bowl, more often it is used to describe a situation that has both good parts and bad parts. An afternoon at the movie theater, for instance, would be a mixed bag if your favorite movie were showing, but if you had to eat gravel instead of popcorn. A trip to the zoo would be a very mixed bag if the weather were beautiful, but all of the man-and woman-eating lions were running around loose." And so it is for the bad-luck Baudelaires. Their fancy new 71-bedroom home on 667 Dark Avenue is inhabited by Esmé Gigi Geniveve Squalor (the city's sixth most important financial advisor), and her kindly husband, Jerome, who doesn't like to argue. Esmé is obsessed by the trends du jour (orphans are "in"), and because elevators are "out," Sunny, Violet, and Klaus have to trudge up 66 flights of stairs to reach the Squalors' penthouse apartment. (Other unfortunate trends include pinstripe suits, aqueous martinis--water with a faint olive-y taste--parsley soda, and ocean decorations.) As the book begins, the Baudelaires are not only frightened in anticipation of their next (inevitable) encounter with the evil, moneygrubbing Count Olaf but they are also mourning the disappearance of their dear new friends from The Austere Academy, the Quagmires. It doesn't take long for Olaf to show up in another of his horrific disguises... but if he is on Dark Avenue, what has he done with the Quagmires? Once again, the resourceful orphans use their unique talents (Violet's inventions, Klaus's research skills, and the infant Sunny's strong teeth) in a fruitless attempt to escape from terrible tragedy. Is there a gleam of hope for the orphans and their new friends? Most certainly not. 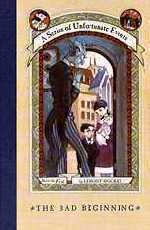 The seventh book in Lemony Snicket's splendidly gloomy Series of Unfortunate Events shadows the three Baudelaire orphans as they plummet headlong into their next misadventure. Mr. Poe, their ineffective legal guardian, having exhausted all options for finding them a new home with relatives (including their 19th cousin), sadly entrusts his young charges' fate to a progressive guardian program formed with the premise "It takes a village to raise a child." Before they know it, the Baudelaires are being whisked off on a bus to a village (vile) named "V.F.D." Snicket fans who read The Austere Academy and The Ersatz Elevator will jump to see these three initials, as they provide a clue to the tragic disappearance of the Baudelaires' friends, the beloved, equally orphaned Quagmire triplets. To the orphans' dismay, V.F.D. is covered in crows--so much so that the whole village is pitch-black and trembling. "The crows weren't squawking or cawing, which is what crows often do, or playing the trumpet, which crows practically never do, but the town was far from silent. The air was filled with the sounds the crows made as they moved around." Another disturbing element of the town is that the Council of Elders (who wear creepy crow hats) has thousands of rules, such as "don't hurt crows" and "don't build mechanical devices." Fortunately, the Baudelaires are taken in by a kindly handyman named Hector who cooks them delicious Mexican food and secretly breaks rules. Still, neither Hector nor an entire village can protect the orphans from the clutches of the money-grubbing Count Olaf, who has relentlessly pursued them (actually, just their fortune) since The Bad Beginning. As you might expect, nothing but woe befalls the unlucky Baudelaire orphans in the eighth grim tale in Lemony Snicket's Series of Unfortunate Events. Ever since the orphans' photographs were plastered across the front page of The Daily Punctilio in an article falsely accusing them of murder, they have been on the run. Only when they disguise themselves as cheerful hospital volunteers (Volunteers Fighting Disease, to be exact), do they see a possible refuge. Of course, this backfires hideously. Where is their ineffectual guardian, Mr. Poe, when they need him most? Will the evil, greedy Count Olaf be successful in giving poor Violet a cranioectomy at the Heimlich Hospital? Is a heart-shaped balloon really better than water for a thirsty patient? Is no news really good news? 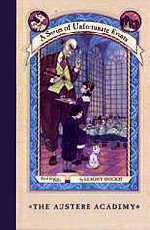 As ever, Snicket refuses to comfort young readers with cozy answers and satisfying escapes. And, as ever, there are plenty of rusty blades and horrible plot twists to make us shudder and shameless-but-hilarious wordplay to make us grimace happily. Bring on the next one! 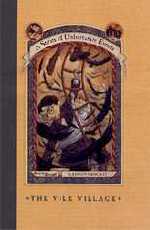 In the ninth title in Lemony Snicket's A Series of Unfortunate Events, The Carnivorous Carnival, the Baudelaire siblings are falsely accused of murder. 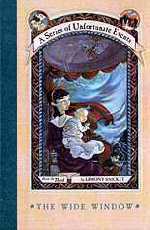 On the run from Count Olaf (the real killer), the three disguise themselves in Madame Lulu's House of Freaks; Violet and Klaus masquerade as the two-headed Beverly/Elliot; Sunny poses as Chabo the Wolf Baby. Snicket's saga about the charming, intelligent, and grossly unlucky Baudelaire orphans continues to alarm its distressed and suspicious fans the world over. The tenth book in this outrageous publishing effort features more than the usual dose of distressing details, such as snow gnats, an organized troupe of youngsters, an evil villain with a dastardly plan, a secret headquarters, and some dangerous antics you should not try at home. It's tough when the things that stand between you and your desired sugar bowl are a host of deadly mushrooms and an uncomfortable diving suit. 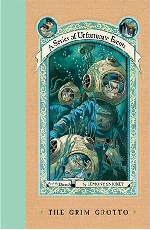 The unlucky Baudelaire orphans find themselves in deep (once again) in this eleventh book in Lemony Snicket's odd-and-full-of-woe-but-quite-funny Series of Unfortunate Events. In The Grim Grotto, the siblings find themselves headed down Stricken Stream on a broken toboggan when they are spotted by the submarine Queequeg, carrying Captain Widdershins, his somewhat volatile stepdaughter Fiona, and optimistic Phil from Lucky Smells Lumbermill. 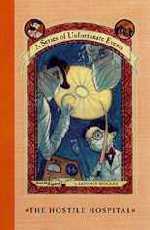 The adventures that follow as the crew tries to get to the aforementioned sugar bowl before Count Olaf are so horrible that the narrator inserts factual information about the water cycle so that readers will get bored and stop reading the book. It doesn't work. As per usual, readers will want to soak up every awful detail and follow the Baudelaires all the way back to the place we first met them--Briny Beach. 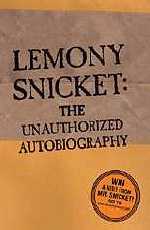 Lemony Snicket is letting out all the stops in this next-to-last undertaking. 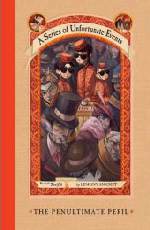 The Baudelaire orphans are sent to the Hotel Denouement, where they meet old pals from earlier stories and act as concierge-detectives. The hotel is run by Frank and Ernest and is arranged according to Dewey decimal classification. Narrator Tim Curry demonstrates his considerable talent delivering great puns, wordplay, singing, and the best villainous cackle anywhere. There are even more word definitions than usual, and hearing the hotel clock gong "WRONG" on the hour, as if on cue, is hilarious. Tell your future with this update on the classic toy!